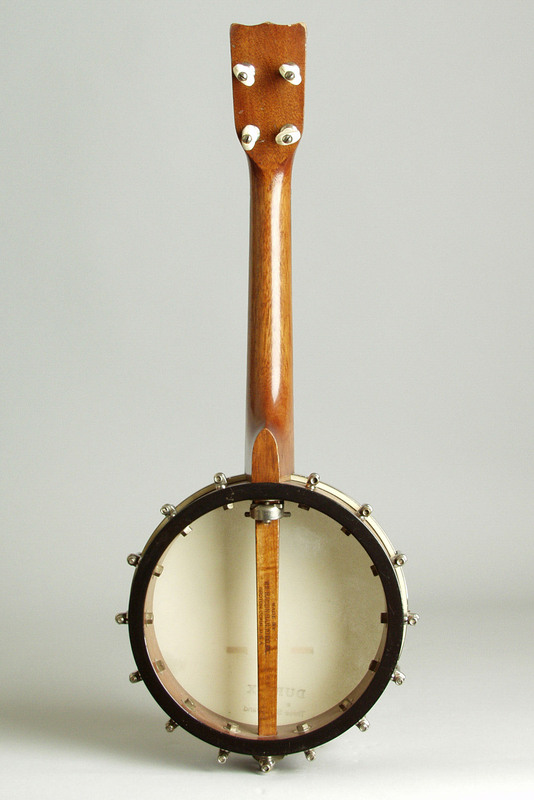 Bacon Style #1 Model Banjo Ukulele (1926), made in Groton CT, serial # 14989, natural mahogany finish, mahogany neck and rim, ebonized fingerboard, gig bag case. These little mahogany Bacon Style 1s are one of our favorites, and just about the best-sounding openback banjo-ukes ever made. The neck and rim are mahogany construction with high-grade nickel-plated hardware, including a heavy brass hoop and Champion-style pegs. The mahogany neck has a dot inlaid ebonized maple fingerboard and a headstock inlaid with a celluloid "Bacon" script logo. 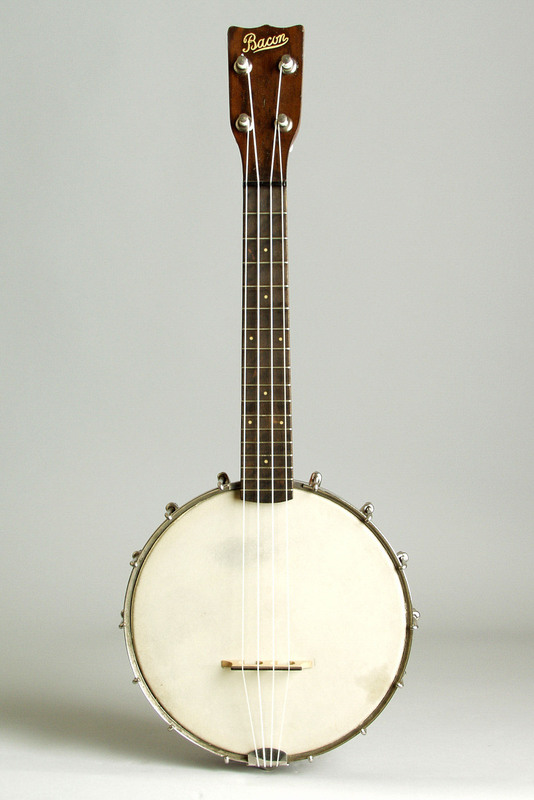 This was the least expensive instrument made by Bacon/B&D but is still of much higher quality than most other banjo-ukes. Overall length is 22 in. (55.9 cm. ), 8 in. (20.3 cm.) diameter head, and 2 1/4 in. (5.7 cm.) in depth, measured at side of rim. Scale length is 14 in. (356 mm.). Width of nut is 1 1/4 in. (32 mm.). A nice original example with some light wear but no repairs or modifications. Sounds and plays excellent. 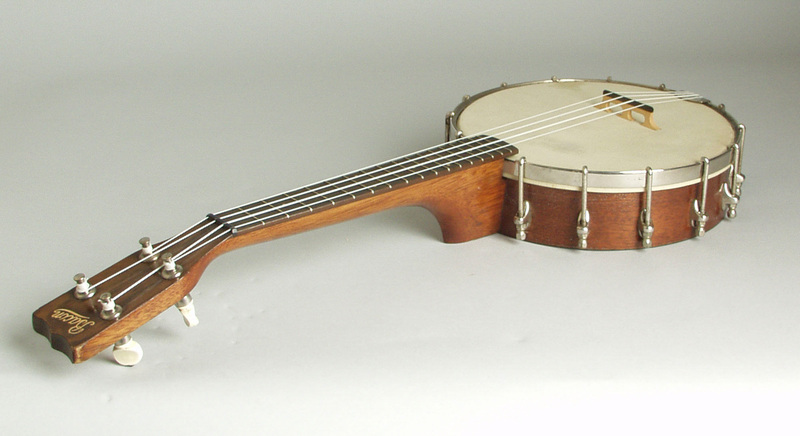 A very fine, simple, but high-grade banjo-uke. Excellent - Condition.